The interdisciplinary project aims to model the role of the "Active Self" in the context of situated real-time interaction in a dynamic/spatial environment in collaboration with Prof. Stefan Kopp (University of Bielefeld), funded by the DFG SPP 2134 "The Active Self". This project aims to explore the role of the active self in real-time control of spatial action within a dynamic environment. The project takes a computational modeling approach based on prediction-based processing. 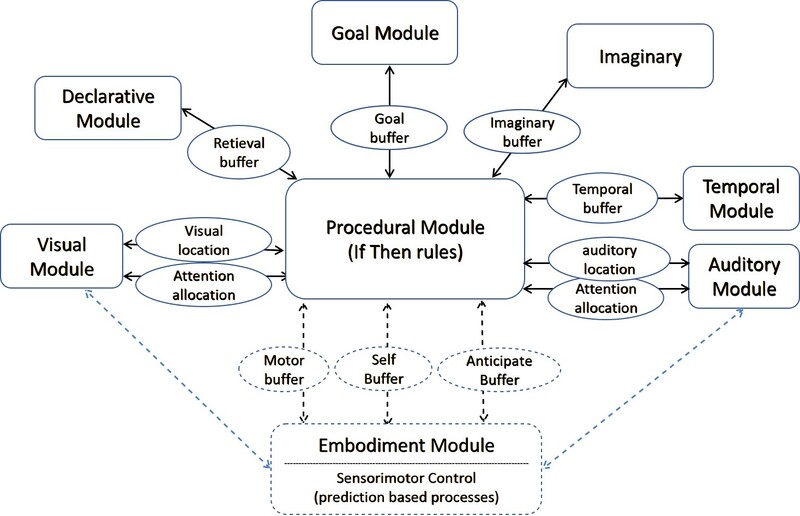 A cognitive architecture will be endowed with sensory-motor abilities grounded in a simulated body, to model how the active self arises from the interplay between embodied perception-action control processes with higher-level cognitive control processes. Both layers are assumed to contribute to the active self by predicting effects of actions and dealing with spatial or temporal prediction errors. 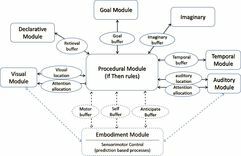 In this setting, an embodied cognitive agent must internally form a representation of the momentary self and develop a predictive sense of agency to assess whether changes brought about in the task environment are due to its own actions or not, and how to adapt appropriately. We will explore these questions through developing an embodied cognitive architecture that will be used for (a) detailed explanation of specific hypotheses about the mechanisms and processes underlying the sense of agency and the active self; (b) simulation of situated action in different environmental contexts along with predictions about a subjectively perceived sense of agency, (c) detailed model predictions that will be validated against empirical data on human behavior and sense of agency in the same task environment. This will be done throughout three consecutive, increasingly complex scenarios in which we induce systematic distortions of action outcomes, vary (self-)beliefs about one’s own expertise, or impose the concurrent execution of multiple actions. The resulting embodied architecture should serve the interdisciplinary community to test further hypotheses in more complex situations or to apply it to artificial agent and robot applications. As of December 13th, a position as Research assistant (100% E13 TV-L) is now open.